Seriously good guides will make your trip all it can be. Our guides have years of experience guiding and experience matters when you are planning a trip in a short window of time. Everyone can have good days, but our experienced guides know how to get fish even when the fishing gets challenging. We are group of dedicated fisherman who will do what it takes to make your fishing adventure all that it can be. Scott never had a chance. He was on the back deck of a sport fishing boat as soon as he could walk. Introduced to the waters surrounding Vancouver Island by his Grandfather, fishing was a family affair. Scott started his working life on the water aboard a commercial crab vessel before making the transition into sport fishing. Spending the first four years guiding in the Haida Gwaii before slowly working his way down the Coast to Ucluelet, he can attest that the waters surrounding the Pacific Rim offer some of the most productive salmon and halibut fishing anywhere. Although the fishing is paramount, Scott never forgets the importance of crafting a complete experience. Whenever the opportunity arises, expect an education on local wildlife and coastal history. He understands the importance of customizing every charter to his guest’s individual needs and will do everything possible to produce lasting memories of your time spent on the water. Scott is the operations manager for Salmon Eye so you may see him even if you aren't fishing with him. Dan is the only one left of the original guides in Ucluelet and loves catching large salmon. This passion doesn’t affect his halibut fishing–he can do both well—but he’s passionate about seeing large Chinook salmon come to the dock. Dan has more patience than most and will wait out in a spot when everyone else has given up. His experience is often rewarded and he has a reputation for catching fewer total salmon so that he can get the big one. 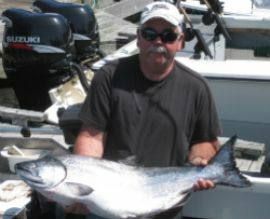 He is one of the best at fishing large spoons or whole herring while the Chinook (Kings) are running during July and August. We all admire Dan’s ability to figure out where the bigger Chinook (Kings) are hiding. He guided a third place finish in one of two salmon derbies during 2009, the largest salmon in the Ucluelet Salmon Ladder Derby 2010, and the winner of the Ucluelet Ladder Salmon Derby final fish-off in 2011. Ucluelet hasn't had any derbies for a few years, but if there was Dan would be at the top. Keith was born and raised in Ucluelet, and has been fishing our beautiful local waters his entire life. Growing up, Keith's father had him working on board their family commercial fishing boat named after his grandmother. His wealth of knowledge, experience and positive attitude are what make him a great charter captain. He is an avid fisher and knows how to reel them in. Previous to being hired by Salmon Eye Keith spent with 32 years as captain of a 50' Canadian Princess party boat and the last couple years running a couple of sport boats as they changed their program. He not only has a wealth of knowledge about the area, but he also know how to give you a great time! Whether you are new to sport fishing or a grizzled veteran, he will assure you have a memorable time on the West Coast and go home with your own fishing tales to share. On his downtime, you can find Keith on the golf course for a round of 9, 18 or maybe 27 holes if the weather permits. Andrew came out to the west coast on a fishing trip 7 years ago and totally fell in love. He grew fishing on lakes and rivers but adapted to the ocean quickly and hasn’t looked back. He started guiding in Nootka Sound but soon headed down to Ucluelet to guide here since the action is often non-stop. Andrew became part of the Oak Bay team at the Canadian princess here in Ucluelet running a 28ft welded aluminum boat. 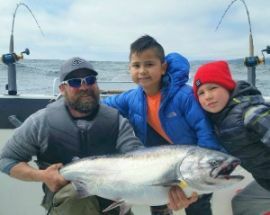 Here he learned from some of the oldest captains in the area and fell in love with Ucluelet fishing. Ucluelet is such a beautiful area and so there are many different techniques depending on which area you choose to fish for the day. This is a good match for a competitive fisherman. But to Andrew, guiding is so much more to me then going out and catching fish. He loves meeting people from all over the world and entertaining them as they are on the hunt for the years catch of salmon and halibut. Andrew works very hard to make sure your trip is worth the wait. 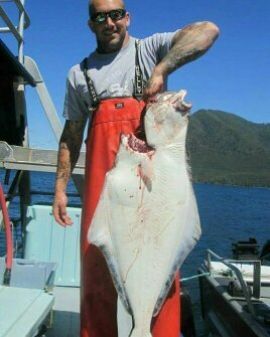 Dave grew up fishing the Port Alberni inlet, about 1.5 hours from Ucluelet. Here he fished Chinook, Coho and Sockeye salmon on both the saltwater and the river. During the winters he was an avid steelhead fisherman—and still is. Lets just say he will fish in all seasons regardless of temperature. Starting as a teen, Dave worked for about 10 years on commercial boats, fishing the entire BC coast. When he made the transition to fishing guide he never looked back. Over the past 17 seasons he as spent most of the summer on the water helping people realize their dreams of catching salmon and halibut. He tries to create the best possible fishing experience possible whether its your 1st time coming or whether you have reeled in 100’s of salmon. Luke loves fishing so much that on most days off he still has a line in the water. His wife would best describe him as a labrador retriever. Fun, full of energy, and loves the water. And fish. His passion for salmon fishing began at a young age spending his childhood summers fishing in Sooke BC. During his summers off from university he began guiding in Ucluelet with the Canadian Princess Resort and has been here since. Now he has many days experience navigating the largest area to fish salmon and halibut on the BC coast. Luke can also impress you with his knowledge of marine life around the ocean and his passion for renewable fish stocks. Whether you are a novice fisherman or an experienced angler, you should have a ton of fun! 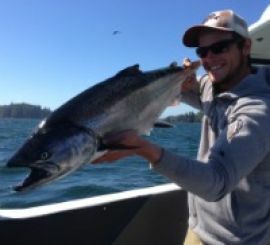 Sam is the owner of Salmon Eye Charters and is thrilled to have such great guides working with him. Having a skilled team creates the perfect environment to ensure every boat produces fish and, at the same time, leaves clients happy. 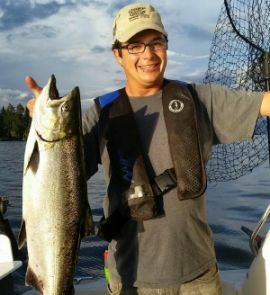 Sam is one of the primary contacts for Salmon Eye Charters, so chances are you will talk to him when booking your trip. He doesn't guide much anymore but you may see him around the office. You may have seen Sam on the Outdoor Channel or heard him on the radio talking about salmon fishing in British Columbia. 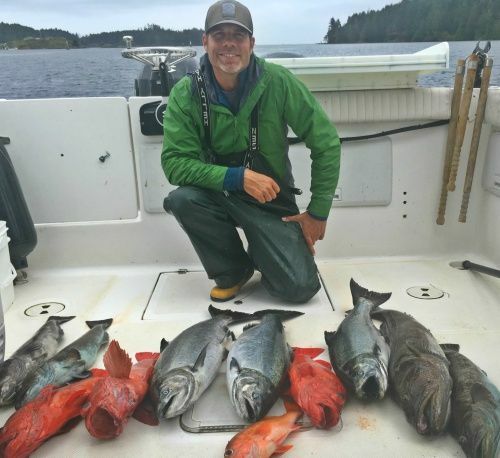 With experienced guides, safe and comfortable boats, the best accommodation for your money, and a quality vacuum-packed product to take home with you, Sam is committed to keeping Salmon Eye Charters as one of the top sport fishing tour companies out there.